钟晓, 王平贤, 胡文刚, 王青青, 李龙坤, 黄赤兵. 钠钙交换体亚型2在大鼠逼尿肌细胞中的表达与功能[J]. 第三军医大学学报, 2018, 40(4): 302-306. ZHONG Xiao, WANG Pingxian, HU Wengang, WANG Qingqing, LI Longkun, HUANG Chibing. Expression of sodium/calcium exchanger subtype 2 and its physiological role in detrusor cells of rats[J]. Journal of Third Military Medical University, 2018, 40(4): 302-306. [Abstract] Objective To investigate the expression of sodium/calcium exchanger subtype 2 (NCX2) and explore its physiological role in detrusor cells of rats. Methods The bladder tissue was taken from 7 female and 3 male Wistar rats with the brain tissue as the control, and the detrusor cells were isolated from the bladder tissue using acute enzyme digestion technique. 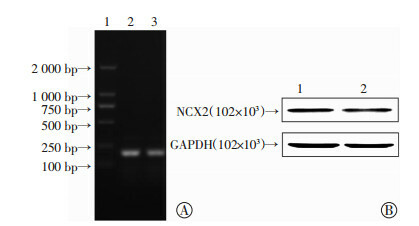 RT-PCR and Western blotting were used to detect the expression of NCX2 at mRNA and protein respectively in the bladder and brain tissues of the rats. Double-label immunofluorescence assay was used to verify the localization of NCX2 expression in the detrusor cells. NCX2 current was recorded using the whole-cell patch-clamp technique on the detrusor cells in the presence of the antagonist KB-R7943 (5 μmol/L). 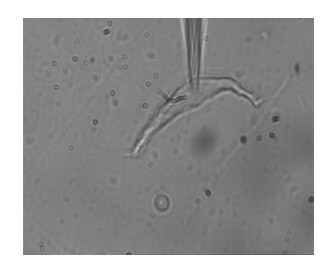 Results The acutely isolated detrusor cells showed predominantly a spindle-shaped morphology under microscope and were immunocytochemically positive for α-actin. NCX2 expression was detected in both the bladder and brain tissues of the rats with similar expression levels between the 2 tissues. 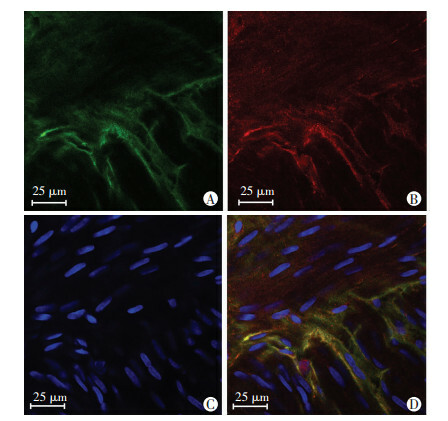 Double-label immunofluorescence confirmed that NCX2 expression was localized on the detrusor cells, and NCX2 currents were detected in the detrusor cells with a current density of 0.79±0.45 pA/pF. Conclusion NCX2 is expressed on the detrusor cells of rats and the electrophysiological evidence obtained suggests that NCX2 contributes to the maintenance of intracellular calcium homeostasis in the detrusor cells, but its exact physiological role still needs further investigation. 李文刚, 方强, 杨景, 等. 活性氧在急性尿潴留大鼠膀胱功能损害中的作用研究[J]. 第三军医大学学报, 2005, 27(4): 331–333. 李文刚, 方强, 卢根生, 等. 急性尿潴留大鼠膀胱组织黄嘌呤氧化还原酶活性变化及其意义[J]. 第三军医大学学报, 2006, 28(9): 973–975. 钟晓, 王平贤, 胡文刚, 王青青, 李龙坤, 黄赤兵. ZHONG Xiao, WANG Pingxian, HU Wengang, WANG Qingqing, LI Longkun, HUANG Chibing.